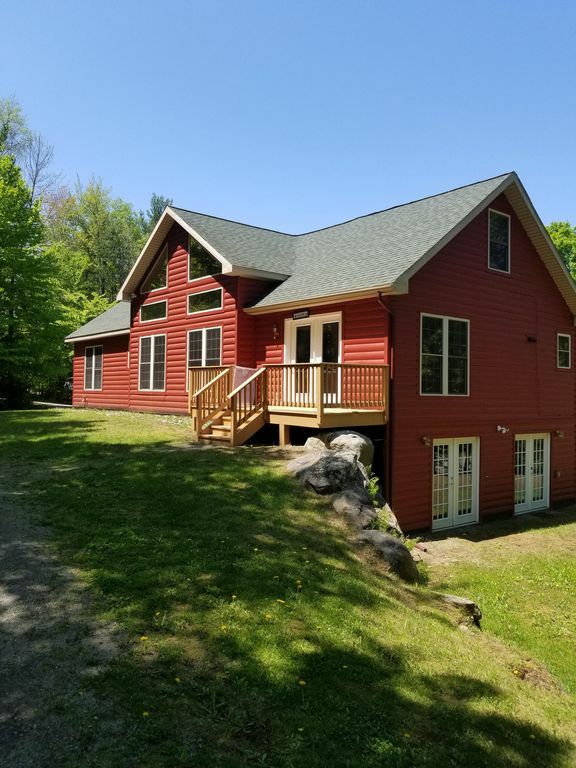 Beautiful spacious home on one of the most pristine lakes in the Adirondacks. This house is available for monthly rental at a discount May to October, please contact for pricing. The house is located 500 feet from a shared 280ft sandy beach. It has everything you need it is fully furnished including kitchen utensils. There are 4 bedrooms, 2 upstairs with two double beds in each and a shared full bathroom, two downstairs both with queen sized beds, one with and in suite bathroom including a Jacuzzi tub. There is a full sized eat in kitchen, living room with T.V. and dinning room. Dock space may be available. The home is a short drive to both Lake George Area and Gore Mountain. 3 Bathrooms, please bring your own towel. Outdoor fire pit. Dock Space for your boat available upon request. 280ft Shared Sandy Beach. We had a great time at this house. Everyone slept comfortably and all we needed was available. The house was a short walk to the lake and a short drive to lake George as well. The yard space and fire pit were very nice as well! We enjoyed this house a lot and hope to stay again! Everything was great . My two recommendation s would be blankets and a land line phone. Great space, especially with kids. Nice fire pit, great yard for kids to run, plenty of space inside. This house was beautiful and very clean. The pictures provided are a very accurate description of what to expect from the house. There’s so much space, inside & out. We thought the location was great with a short walk to Brant Lake, and a short drive to Lake George. The property manager and owner were very accommodating. We had to contact the property manager a few times and she answered promptly every time. The owner even let us park at his house which is directly across from the lake. This was great for getting the kayaks down, as well as children and senior citizens. The only reason I am leaving 4 stars instead of 5 is b/c of the heat. Unfortunately for us, we chose a weekend that happened to be the hottest of the year. We know that is out of everyone’s control, but we just wish more was done to battle that heat. It would’ve helped a lot if there were at least curtains on the windows to block the heat. We were able to work something out, but it was uncomfortable for a little bit. I did notice some complaints from previous renters that we just did not see. We didn’t think the house was sparsely furnished. What we needed was there, and it was completely fine. We saw no issues with the lighting in the house. There were some discrepancies on certain amenities listed, but those items were cleared up before we went up there. The upstairs shower is small and works better as a tub than a shower, but I felt that was shown in the pictures so we expected that before we went up. It is the first year this house is rented, so I’m sure any issues that may arise will be worked out, especially since we continually saw prompt accommodating responses. All in all, we really enjoyed the house, and had a great vacation. I would recommend others to stay here. We were very excited to start our Brant Lake vacation with our extended family. The house itself is beautiful and in a great location. The yard and the shared beach are very nice. However, there were some critical details that were overlooked , making it feel like this rental was put on the market before it was ready. There were smoke detectors missing batteries. There was basic cable, but no internet, even though it was stated that they had free wifi in the VRBO description. There was also no cell service and no landline. If an emergency call had to be placed, someone would have had to leave the property and drive down the road towards town to place a call. The house was sparsely furnished, with only beds in the bedrooms. There were no nightstands, dressers, or reading lamps. There were no towel racks or hooks in any of the bathrooms. Every room was equipped with a ceiling fan with a light. The vaulted ceiling fan in the living room didn't provide significant light. We had to purchase a lamp in order to read in the living room at night. The upstairs rooms were very warm, we were glad that we brought extra fans. The upstairs bathroom had a bathtub with a low-placed shower head but no shower curtain. There was no room to take a shower. It truly is for a bath only (even though the description stated it was a tub/shower). The walls only had sheet rock, no tile, so we had to be careful not to get it wet. The deck and yard are beautiful and comfortable, but you are not able to see the lake or the mountains as stated in the property description. I would also recommend that there should be directions for how to access the shared beach and what is available there for use. Overall, what could have been a great vacation experience was diminished due to the house not being ready for weekly tenants. the basic of cable service. I would not recommend this property for vacation. I am sorry you were disappointed with your vacation. This is our first year renting the house as a vacation rental. We will take all of your suggestions under advisement to make the house better for the future. Thank you for your feedback. Beautiful Brant Lake is located on scenic route 8. Brant Lake is located 20minutes from Lake George and Gore Mountain. There are many things to do in Brant Lake including biking, hiking, skiing, swimming, boating, and kayaking. This house is available for monthly rental at a discounted rate May to October, please contact for pricing. 100% refund if canceled at least 30 days before arrival date. In the event of a cancellation it is necessary to notify the owner as soon as possible. Attempts will be made to re-rent your accommodation. If we are successful, your deposit will be refunded in full. This agreement shall not be assigned or the premises sublet without written consent of Landlord. If cancellation occurs within 8 weeks of the check in date all measures will be used to re-rent the property. If re-rented 100% of rental will be refunded. In ability tore-rent will result in 75% of the rental fee. Security deposit will be returned upon check out inspection.